C program to print the left arrow star pattern – In this article, we will summarise in on the different methods to print a left arrow star pattern in C programming. As the name of the heading suggests, you need to print a left arrow star pattern. 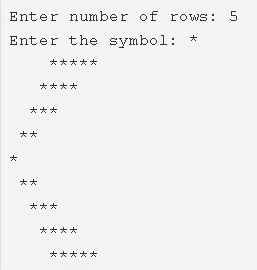 As it is implied by the photo, firstly, you need to enter the number of rows. Then, the arrow will be printed accordingly. Read the entered rows number, entered symbol and store the number into the variable n, symbol into the variable ch. 2) The 1st for loop iterates through rows with the structure for(i=1,i<=n;i++). b) The 3rd for loop iterates through columns with the structure for(j=i;j<=n;j++). After above steps, the upper part of the left arrow star pattern will be printed. 3) The 4th for loop with the structure for(i=1;i<n;i++) iterates through rows. a) The 5th for loop with the structure for(j=0;j<i;j++) iterates through columns. b) The 6th for loop iterates through columns with the structure for(j=0;j<=i;j++). After the above steps, the lower part of the left arrow star pattern will be printed. The 1st while loop with the structure i<=n iterates through rows until the condition becomes false. a) j=1, The 2nd while loop iterates through columns until the condition j<=n-i becomes false. b) j=i, The 3rd while loop iterates through columns until the condition j<=n fails. This loop prints the symbol which is entered by the user.j value increased by 1.
c) Cursor comes to next line.i value increased by 1. After the above steps, we will get half part of the left arrow star pattern. 2) i=1, The 4th while loop iterates through rows until the condition i<n becomes false. a) j=0, The 5th while loop iterates through columns until the condition j<i fails. b) j=0, The 6th while loop iterates through columns until the condition j<=i fails. From the above steps, we will get next half part of the left arrow star pattern. Checks the condition j<=n-i.If the condition is true then loop iterates again.Repeats until the condition becomes false. b) j=i, The 3rd do-while loop iterates through columns. Prints symbol.j value increased by 1. Checks the condition j<=n.If the condition is true then loop iterates again.Repeats until the condition becomes false. c) Cursor comes to next line.i value increased by 1.Checks the condition i<=n. If the condition is true then loop iterates again.Repeats until the condition becomes false. By the above steps, we will get the half part of the left arrow star pattern. 2) i=1, The 4th do-while loop iterates through rows. a) j=0, the 5th do-while loop iterates through columns. Prints space.j value increased by 1. Checks the condition j<i.If the condition is true then loop iterates again.Repeats until the condition becomes false. b) j=0, the 6th do-while loop iterates through columns. Checks the condition j<=i.If the condition is true loop iterates again. Repeats until the condition becomes false. c) Cursor comes to next line.i value increased by 1.Checks the condition i<n. If the condition is true then loop iterates again.Repeats until the condition becomes false. From the above steps, we will get remaining half part of the left arrow star pattern.